According to NAHB analysis of Census Bureau’s quarterly data, property taxes made up 38.9% of state and local tax receipts among major sources over the last four quarters. Property tax collections, including commercial real property taxes and personal property taxes, totaled more than $503 billion over the last year. This represents an increase of almost $13 billion, as measured on a four-quarter trailing basis, or an almost 3% gain. From the second quarter of 2014 to the end of the second quarter of 2015, sales taxes and individual taxes were the next largest revenue sources at 27.9% and 28.7% respectively. 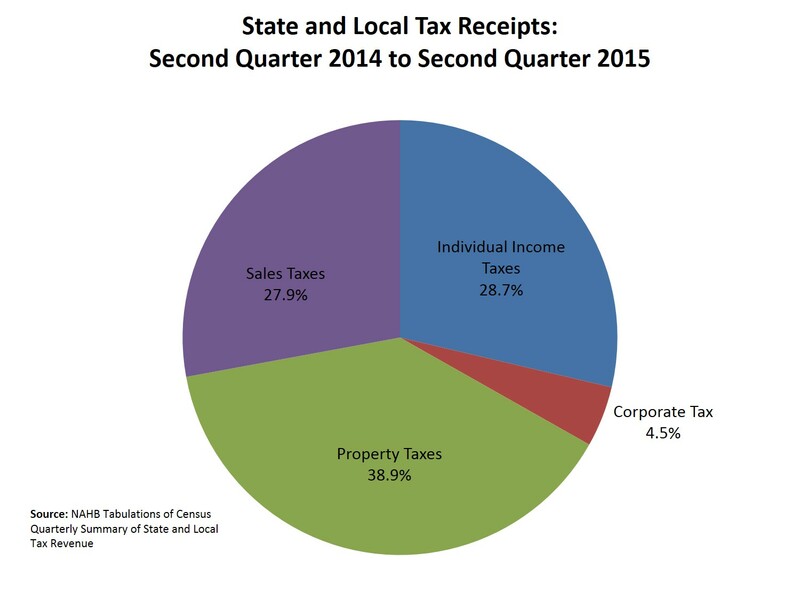 At 4.5%, corporate income taxes held the smallest share of state and local tax receipts. 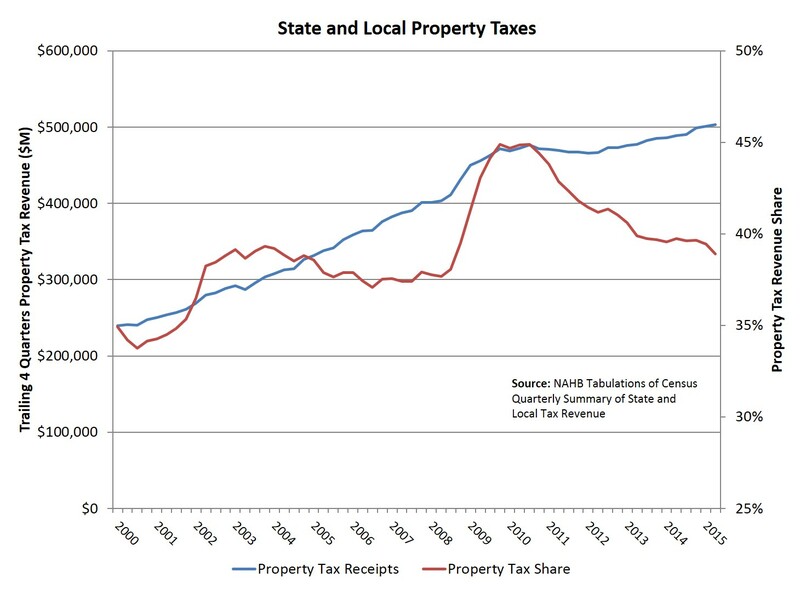 Gains for state and local non-property tax collections have outpaced increases in property tax receipts in recent years because such non-property taxes experienced the greatest declines during the recession. This impact pushed the property tax share of total receipts from the four major sources from a high of 44.9% in the third quarter of 2010 to just below 39% for the second quarter of 2015. The current share is close to the pre-housing boom average of 38% (on a four-quarter basis) for the period of 2001-2003. Lagging property assessments and annual adjustments smooth property tax collections across business cycles, and as such nominal property tax collections are not as prone to cyclical fluctuations as other tax collections. * Data footnote: Census data for property tax collections include taxes paid for all real estate assets (as well as personal property), including owner-occupied homes, rental housing, commercial real estate, and agriculture. However, housing’s share is the largest when considering the stock of both owner-occupied and rental housing units. ‹ Residential Mortgages: Who Borrows What?